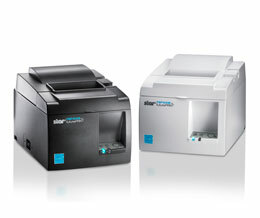 The first receipt printer which has realized the Lightning connection which can communicate with USB on iOS devices such as iPhone and iPad and can charge them at maximum 2.4A. Equipped with WPS compatible wireless LAN interface enabling the easy wireless setup procedure with high security. - 5V USB port allows mobile device charging. Achieved the printing speed of 250mm/s which is the highest in the futurePRNT series thermal printers. The stylish new color, Ultra-White, is lined up. Adopted cool blue based logo design and LED. The package includes printer, sample thermal roll paper, power cable, USB cable (USB I/F model) and wall-mount kit. HTML manual provides the latest documents any time. Easy installation, setting configuration and other practical supports by special utility applications downloadable from App Store and Google Play. * iOS or Android utility applications. (Note)*The frequency of this product is commonly used by other devices such as microwaves. Please make sure prior to the usage that it is not affected by radio waves of such devices.